Carpool Karaoke as ride-along inspiration in the middle of hard working week? Take a few minutes to let Paul and James take the wheel. And how does Canada fare in public transit? Read on. Carpool stats in Canada are strong. While we don’t have the happy company of a Corden, or a McCartney to speed our drive time, Canadians are quick to hoof it, hop on their bicycles, jump on the bus, or share a ride with a co-worker. Big city dwellers are eager to walk, cycle, carpool, and use public transit, with Toronto and Vancouver commuters accessing all options. Montreal’s daily travelers trail behind in carpool practice, but are more likely to choose cycling as an option. cycling to work were the highest of all CMAs. In terms of square kilometres, the Halifax CMA is the fifth largest of all CMAs. Despite its size, when compared with the other mid-sized CMAs (in population terms), Halifax had the second-highest rate of commuters using sustainable transportation. 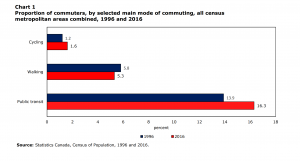 It had the highest proportion of carpoolers (15.6%) and commuters using public transit (11.8%) and the second-highest proportion of commuters using active transportation (9.2%).